Advanced Energy Economy Institute (AEEI), AEE's educational and charitable affiliate, commissioned Pike Research, a part of Navigant, to perform, for the first time, a quantitative and qualitative analysis of the advanced energy markets in the U.S. and globally. Their report, The Economic Impacts of Advanced Energy, identifies seven broad industry segments, which are further broken down to 41 distinct subsegments representing specific technologies, products, or services. 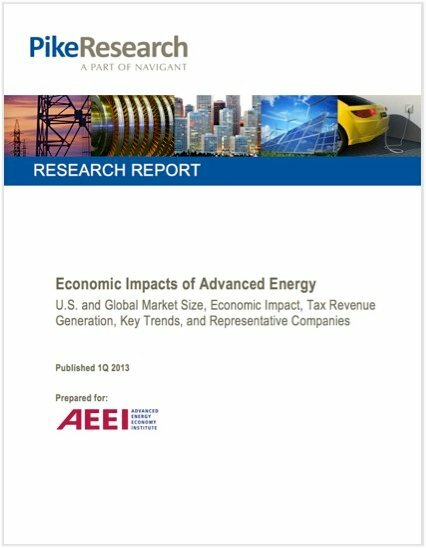 The report draws upon over 60 previously published Pike Research studies, as well as information maintained by Navigant’s Energy Practice, to build an assessment of advanced energy markets measured by revenue generated by the individual product categories, globally and within the United States.